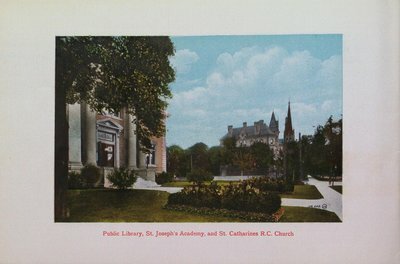 The Public Library, St. Joseph's Academy and St. Catharines Roman Catholic Church, Church Street just before Lyman Street, St. Catharines, Ontario. Souvenir of St. Catharines booklet. 1910. Published by the Valentine & Sons; United Publishing Co., Ltd. The Valentine & Sons United Publishing Co., Ltd.